Recently, I had a couple of health scares; you know, the kind where you start thinking that maybe, just maybe, your time on earth will be much shorter than you had assumed it would be. Suddenly, the cherished notion of dying in your sleep (enlightened, of course, and ready to meet God or the equivalent) at 96 is replaced with the thought that you could meet your end in a couple of years or so, ravaged with cancer in some anonymous hospital bed. If anyone has ever heard the words, “there’s something suspicious in your films,” or “there appears to be a mass here,” then you know what I mean. I followed up diligently with my doctor, went back for more tests and exams, and it turned out that nothing is wrong. However, a certain amount of psychological damage was done that I am still trying to process. This all occurred about the same time that I had made the idiotic (for me, I only speak for me) decision to go off hormone therapy cold turkey. I had decided to go natural, to be “free” of all synthetic substances altering my physiology. It was great for a few days . . . then, all hell broke loose. 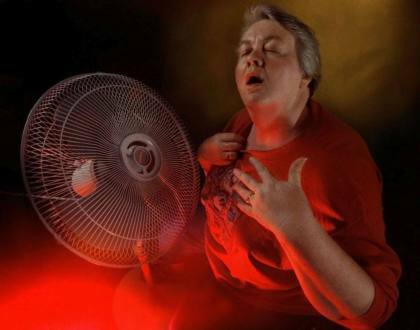 I never understood why menopausal women complained about hot flashes. Hey, feeling a little warm on occasion was no big deal, right? Then, one night, I lay awake feeling that I was about to spontaneously combust from the inside out. It was unbelievable, like demons setting fire under my skin; and then came the copious sweating as my body frantically tried to adjust my temperature. I opened windows, ran outside at 3 AM, and fanned myself with every available magazine. That was nothing, however, compared to what happened to my emotions. I didn’t feel like myself; my well documented anxiety disorder went into overdrive, leaving my with a pounding heart, a sense of not knowing who I was (depersonalization, if you wish to be technical about it), panic attacks of monstrous proportions, feeling hysterical one minute and crushed the next, and all of this while attempting to behave somewhat normally for my family. It seemed that I was truly losing my mind. I couldn’t remember details; I was fuzzy-headed and twitchy. The only upside was a surge of energy, but it was strange energy; the kind that seems suspiciously like the start of some heinous mental illness. I worked out like crazy, but nothing stopped that feeling of being on the edge. What makes this so ridiculous is that I am chronically terrified of medications of any kind. I had a prescription for HRT in my hot little hands, but I was too afraid to take it. Finally, after the nighttime meltdowns became unbearable—not to mention my state of mind—I broke down a few days ago and took the little pill that the media has been telling women is BAD, BAD, BAD and dangerously unnatural. I was raised in a household where doctors were generally evil, and medication that did not come from a delicate flower in an organic field would kill you. Plus, I have this Internet addiction that centers on reading horror stories about drugs and contemplating long lists of mortal side-effects until I spin into total panic. Even so, I had reached the proverbial end of the rope. I took the pill. I am still taking it. I am not dead. Yet. The hot flashes are almost gone; the anxiety has abated. I am even taking a low dose of 5-HTP. I am not back to myself quite yet, because although I am addressing the physical symptoms of The Change, the psychological issues have yet to be tackled. It boils down to this: I know that I have to die one day. I don’t know when that day will come. Early menopause has forced me to face my mortality, my time limit. Fact is, in six months cancer could spring up in my body and take over. I could be involved in a fatal accident on the 405/1o1 interchange (that’s more likely than cancer). There are a million ways I could die. As a paranormal investigator, I should not be afraid anymore. I have proven to myself that some kind of life after death exists, beyond a reasonable doubt. Yet, I am starting to think it’s not DEATH per se that terrifies me, but LIFE. Life is always under threat by something. The thought of contracting an illness that worries and saddens my family and friends is more than I can stand. I spent my childhood sick with one thing or another, and on more occasions that I care to recall, I was officially near death. Sometimes, a doctor was the cause of such misery, and while I would love to really chastise the medical profession for the mistakes they made with me, that’s not the point of this post. You cannot know what is going to happen. You can only live right now. This moment is the only one that exists. The past is over, and the future doesn’t exist. Make the present moment one which you will want to last forever. That is the afterlife—the present moment stretched into forever. If that doesn’t work for me, then I need to take stock of everything and make the changes that will allow me to be happy. In the present moment, I am healthy. In the present moment, I have the best friends in the world and a loving family. Right now, I have an adorable nephew and a brand-new niece. My parents are alive and doing just fine. No one hates anyone at the moment, and there is no drama. Even my kid is happy! My marriage is a source of joy and peace. Even though the house and the cabin might sink in the financial quagmire of recent years, for now we still have both places, and they are beautiful nests that we created. In addition to all those blessings, I have my sisters in the paranormal, the most amazing team of women anywhere. I truly cannot imagine my life without them. We are all seeking the answers together. If the last month has been a test of faith, I hope that I am able to pass it; but as of June 16, 2011, I am on my way. Two years ago, I decided to take my academic and personal interest in the paranormal to a different level. I joined a local group and began a process of inquiry that has taken me to several fascinating places, both literally and figuratively. Since then, I have left two groups, one of which I co-founded with three other people. I founded my soulbank.org site, floated around as an “independent investigator” and formalized the team the Paranormal Housewives, which had started as a project for a proposed television series. I have appeared on three shows and have one in the works for next year. It has been a wild ride, and I have learned more than I ever expected; but the lessons are not the ones I necessarily anticipated. Even though for the most part I consider myself blessed to be part of this community, I have experienced rejection, anger, shock, ridicule, betrayal and true sadness in the course of my paranormal life. I have watched a certain drama play out in several groups, usually culminating in someone leaving a group or being actively excluded from it by the person in charge. I have seen fights break out on Facebook and witnessed intense conflict on investigations over methodology, interpretation of data, someone’s psychic impressions, or someone’s desire to break with group protocol. There have been hurt feelings over decisions concerning who to bring along (and who to exclude) from investigations. I have watched and experienced emotional damage from something as apparently simple as the definition of a team and that team’s rules. There are multiple opportunities for misunderstandings in our community, but I believe that there are tangible ways that we can overcome such issues through direct communication with all members of team, and clear definitions of our expectations and goals. 1. Define what the term “team” means for you. There are formal and informal teams. Some teams are part of the Meetup system, and operate fairly efficiently, usually requiring one meeting and one investigation per month as a requirement for membership. You can lose your membership for not following those guidelines, or for not showing up to an investigation for which you responded “yes” on the RSVP page. You can lose your membership for not paying your dues, for not paying your share for an investigation requiring an up-front fee or for refusing to assist in set-up or break-down of the required equipment. There are informal teams that are little more than friends that hang out at cool places. Those teams are more like close, social units. There is no write-up on the investigation, no documentation or archiving of data collected, no posting of pictures, no formal rules on membership requirements, no meetings, few formal investigations requiring payment to a site or organization on a mass scale and nothing written or formalized regarding expectations of team members. There is no written or codified protocol for investigations, no mission statement, no updated website, no FB or other social networking site account, and so on. This is perfectly acceptable—but is this really a team? Remember that if you are not clear on the rules or have not communicated those rules effectively, you can’t accuse others of breaking them. There are teams who fall somewhere in the middle—not simply a group of friends you have fun together, yet not quite as rigorous as some of the Meetup groups. Those groups have not necessarily formalized their mission, rules, regulations and investigative protocols, but they consist of people who have discussed these issues and are of like mind. These teams can run into trouble down the road when conflict develops—so I recommend that ALL teams who want the ability to control who investigates with them and how the data is collected, stored and used, should take the time to formulate their expectations and publicize them for all those who wish to become members. Who controls the website? What if someone doesn’t like a post or doesn’t agree that a certain EVP should be included? What is the policy on editing others’ posts? Who decides what “counts” as evidence? What process is in place for a team to decide what is worth publishing, and what isn’t? What do you do with those hours of audio and video, with the anomalous photos, with the weird ITC experiences, or any other device you use? Do you have a common storage place for all of that data? Do you require members to review their data? Can you make such a rule? Are guest investigators allowed? Do you need forms, waivers, etc.? Who is going to write them? Who controls their content? Do you investigate private homes? What experience do you require for that task? What is your standard procedure for initiating, carrying out and following up on that type of investigation? What is your policy when a member of your team doesn’t show up to investigations? What is your procedure for “firing” someone from your team? What are your minimum participation requirements for each member? How do you decide to add someone to the team? What if one person objects, but everyone else is in favor? Is your team led by one or two people who make most of the decisions, or do you try to run the team as a democracy by majority vote? Is there a hierarchy in your team by years of experience or specialty? Are team members divided up by area of expertise, or does everyone do everything? Do you have specific titles for your team members? What is the main GOAL or MISSION of your team? Is it to go out and have fun, or collect evidence, or both? Are you attempting to prove life after death, or do you simply prefer to hang out in cool, abandoned places? Do you consider your methodology to be scientific, or is that kind of rigor not that important to you? Are you mostly social, mainly interested in media exposure for the group, (and I am NOT saying that is a bad thing—you can decide that is your goal and work towards that) primarily looking for academic acceptance of your findings, seeking to inform/enlighten the general public, looking for publication possibilities, or are you mostly interested in technology? Which combination of the above best reflects the mission of your team? You have to know what you wish to DO with your group so that your assumptions are clear to new people who join you. 2. Reach an understanding of what constitutes evidence of the paranormal, and what you consider unacceptable. In other words, what attitude does your team take with psychics, mediums, clairvoyants, past-life specialists, and members who use dowsing rods, crystals, Ouija boards, and other tools to contact the dead or see the past or future? Does it bother you if one member or guest “sees” a ghost and describes what he/she is saying, doing or thinking, or do you accept that as evidence? If a medium makes a pronouncement, do you take that as valuable information, or not? If your team decides to take a more “scientific” approach, it’s important to understand what that means. You are not working in a laboratory, nor are your experiments necessarily repeatable in the same conditions. Perhaps there is no point in pretending to follow the scientific method when your lab is a huge, abandoned mental hospital, but that doesn’t mean there can’t be a commonly accepted protocol for your EVP sessions, for example. What ARE your requirements for EVP session? Do you follow the same pattern every time, or do you try new methods? How tolerant are you, as a team, for someone who “provokes” or follows an unorthodox approach to inciting the spirits to speak? What is your team’s attitude towards demonology as an area of study? Are you willing to include a demonologist on an investigation? How do all of you feel about the assumptions of the demonologist—that evil exists and can (and does) infect homes and buildings? Do you all believe that is possible? Do you want to involve yourself in that field of inquiry, or do you wish to avoid those considerations? What do you all personally believe about God, Satan, angels, demons, and other religiously-construed entities or deities? 3. How do you all plan to handle conflict? In all teams there exists the possibility of power struggles, conflicts over protocol for collecting, interpreting and publicizing data/evidence, personality clashes, disagreements on website content, marketing of the team, deciding where to go and when and differing levels of commitment and interest. The more rules you make, the more you have to enforce those rules through punishment. The fewer rules you make, the less prepared you will be to handle situations that upset, annoy or offend you. Make sure to hold a business meeting with all your members at least once per month. Have an agenda; make sure everyone contributes to it and has her say. Anticipate problems and craft solutions; don’t wait for conflict to arise before addressing an issue. Plan your investigations in advance and organize your calendar. Require a certain amount of commitment, but make sure you spell it out. Don’t assume that everyone knows what you expect. Most of all, keep the lines of communication open among members. Don’t rely on Facebook or email or any other electronic form of communication to get your message across. If you can’t have a face-to-face conversation, then at least speak on the phone. So much damage is done on social networking sites and over email, often damage that can never be repaired. There is no substitute for dialogue, debate and discussion. This is not possible on a computer. If you love investigating the paranormal, then do it in a way that ensures the continuity of your team. There is no limit to what we can accomplish as a community if we don’t waste our time on conflict and drama; there is so much to learn and discover. Life is brief, and soon enough we’ll have the answers we seek. In the meantime, the thrill of the journey, the passion for the mysterious, and the joys of the search should never be dampened by our frailties, insecurities and resentments. Open your hearts to possibility and prepare to be amazed. If we are too small, then our discoveries will never be grand. I think as long as people are involved there will always be some sort of drama. Some people seem to thrive on it. I know what you are talking about though. I left a team because of drama and I hate it. As adults you would think everyone could get along but that is not always the case. Thankfully I’m not going through any of that drama now. It’s so nice to just go do your investigations and enjoy your time with others. Your ideas are great ones and I sure hope you don’t find yourself involved in any drama in the future. I have been experiencing paranormal activity for the last 20 years, I am a housewife who is also very interested in this kind of phenomenon. I have activity in my apt. now. I think I could be an asset to your group. Please contact me if interested. I feel a very strong pull in this field. Thank you. Hi Dianne, thank you for writing. At the moment, we can’t accept new members, but we are certainly open to investigating your apartment. If you like, fill out the questionnaire on the “contact us” tab, and send it back to us at paranormalhousewives@yahoo.com. We’ll get back to you quickly once we receive it. Thank you again for writing!